Some new vibes from two underground legends. 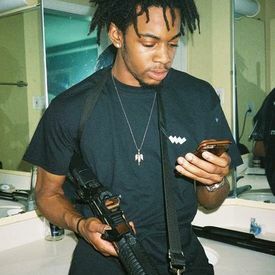 Thouxanbanfauni and Denzel Curry are both very influential in their respective styles and helped a plethora of artists find authenticity and credibility in the Soundcloud scene. Both contrast each other in style, as Denzel priorities aggression and Fauni is more about vibes. However, on this new collaborative cut “Heavy Metal”, they do nothing but shine in their chemistry. “Heavy Metal” exists primarily in Fauni’s signature realm. The beat is light and dreamy, with a heavy 808 bumping it back in to reality every-time the atmosphere takes over. Fauni’s flow is druggy and wavy, as his braggadocios lyrics float over the instrumental. Denzel’s vocals are slightly more energetic, however, he taps into his singing bag opposed to the usual barrages of bars we expect from the Florida emcee. “Heavy Metal” may not be heavy, but it’s ideal whip music for the Winter.